So, I thought it would be interesting to interview some of the folks instrumental in bringing old world wines to Canada. That’s the idea behind The Founders Series of interviews. The folks featured in these videos had a vision of what Ontario’s climate and land could produce. They were risk takers, hard workers, and “all in”. They were competitors, yet collegial, knowing that while they were making their own wine and creating their own brands, they were also building an industry. I’ve set up a dedicated page for linking to the video interviews – it’s called The Founders Series. The first video in The Founders Series is of Herbert Konzelmann, owner and founder of Konzelmann Estate Winery in Niagara-on-the-Lake. 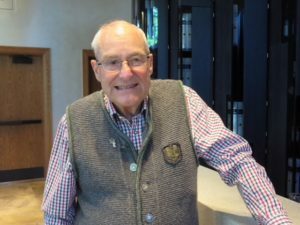 At 81, Mr. Konzelmann is still the driving force behind the winery that’s celebrating its 30th anniversary this year. I offer a heartfelt thank you to Mr. Konzelmann for agreeing to speak with me and to Jessica Chorosinski from the winery for helping set this up. Click here to view the video of Mr. Konzelmann.